Guest Post: There ARE still good people out there! Every once in a while a story comes across the forums that captures my imagination, reinforces a core belief or introduces a new way of looking at things for all of us riders "out there" on the gravel, pavement, trails, or paths. This time, a local rider who has taken part in a handful of rides on my routes and joined me for the Hard Cider trial run earlier this year, John M., took to email to recount details of a recent and seemingly unlikely experience while out on the roads of Eastern Kansas... thanks, John! Last month I needed a 200K and wanted to do my last long ride before RAID (Ride/Race Across Iowa in a Day). As I do too often I waited until the last weekend of the month to ride my 200K. Sunday morning, dark and early, I headed off to ride the Free-State Border Patrol 200K (route #386). Prior to the ride I had asked, and was approved, to ride some bonus miles during the 200+km permanent. Permission was granted based on me both staying under the time limit and exiting/returning to the course at the same location. It was cooler that morning when I'd left home, and I'd thought about adding a bag to my bike to store extra layers. Ultimately I decided I could just put my arm warmers, cap and vest in my jersey pockets. I rode my gravel-ready Salsa Fargo, and after checking in at the Pleasanton control I headed off course and rode some good bonus gravel miles. At my furthest point south, I stopped near Prescott and took off the last of my cool-weather gear, repacked my pockets and proceeded to head back north. 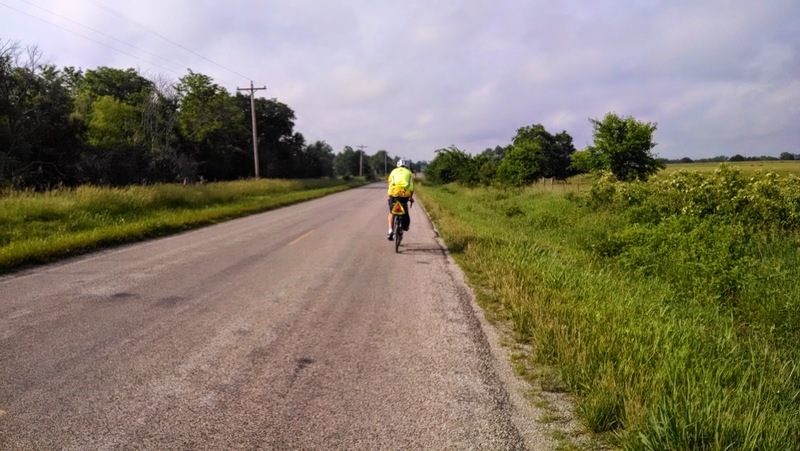 I re-entered the course in Pleasanton and began the ride on toward La Cygne. When I got to the Casey’s Control in La Cygne. I grabbed some pizza, a cold bottle of Gatorade and all the usual stuff. Piling it all on the counter, I reached into my pockets for money. What a surprise and shock it was to find I had NONE! No Money, No Route Card, No receipts, NO ID, No Credit card. The Ziploc bag which contained all of that important stuff was gone! Fortunately the good people at Casey’s helped me out and took good care of me. But I still had NO money, Nothing! I left the Casey's befuddled about my lost card and cash. Without that route card my ride wouldn’t officially count. Without my cash it might make it a bit harder to ride home. I thought to myself, I knew I had everything at the farthest south turn-around. Trying to think back, I'd thought I’d maybe reached back into my pockets, maybe once, only about 10 miles back from LaCygne. I'd convinced myself I must had lost that bag at that point! Resolve bolstered, I decided to ride my route backwards and find my stuff before riding back home. I had to save my 200K! Unfortunately, I never found my Ziploc, and, finally I had to abort looking and head home. Empty handed. By then I'd assumed my stuff was blowing who-knows-where on the wind, never to be seen again! I rode back to LaCygne and remained on course back to Olathe... not that sticking to the course matter much at that point. When I ride the Fargo on that loop I don't normally need to stop after LaCygne... but, that's mainly because when I know I have case, I know I can stop anytime I need to and get anything I want. Of course, when I don't have any money all I can think about is all the stuff I want but can't have! It made for a long ride home! ...forget the fact I'd blown my September 200K! Sure, I had a good 200 mile training ride, but I was not a happy camper! - Don't keep all your eggs in one Ziploc! - Pay attention to your stuff! Keep the important stuff in a zipped pocket, in the seat-bag, or otherwise stashed away ... ANYwhere other than back pockets that you might be getting in and out of all day. Just pulling out a cue sheet or a snack might seem easy enough, but you can never know if something stuck to it, or if a gloved-hand accidentally grabbed onto something else in the process. I thought that was the end of this story. . .
. . . but, there are actually Good People out there! First the Good Folks at Casey’s gave me anything I'd needed, as I stood at the counter emptying my pockets all over the place. There I stood, not a penny in hand! Yet, they still helped me! This is the payback of always being polite and appreciative of our hosts along the route.... yes, even if they have no idea what they're hosting. The attitude we put out there could pay us back someday! A bit later, life going on as usual, I arrive home from a week of being out of town. My wife does a great job while I'm gone, taking care of many things! One of them, of course, being the mail. She takes care of the important mail, gets rid of the junk mail, sorts the work stuff and leaves me the few fun/personal items I occasionally get. Upon examining this, and to my surprise and amazement, I have waiting for me a nice hand-written note, my route card, cash, credit card, ID and receipts... everything I lost on that Sunday ride! This Great American found my Ziploc while walking along a gravel road not far from his home. He'd not only found it, but took the time to write me a note and mail all my stuff back to me! Yes, indeed, there really are GREAT People out there! God Bless this Country and all the Good People that make it Great! Keep 'em rollin'! Yeah, that's not John... but, hey, every post needs at least one photo.